The latest game from Zynga brings a delicious twist to the match-3 puzzle game genre. Crazy Cake Swap lets you match treats and complete unique objectives to boost your bakery sales. You will have to match sweets to meet your customers’ demands, create paths on the game board to let them enter your bakery and find friends trapped inside rock candies. The game offers a refreshing take on mobile’s most popular genre and fans will relish every morsel of it. The visuals are pleasing to the eye and objectives are fun and engaging. These tips, hints and tricks will help you complete objectives, create special treats and know what each special treat can do to satisfy your customer’s sweet tooth. 1. When you tap a Frosting Popper, you don’t use a move. 2. Match a frosting popper with sweets of the same color to add more poppers to it. After matching, a number is shown beside the popper, suggesting how many same-colored objects it will remove from the game board once it is popped. If you match two hearts with a red popper, 2 more poppers will be added to it, making it 3. Tap the popper and 3 splashes will destroy 3 hearts. 3. Swap a Popper with a line blaster. The popper’s splash will pop a treat of the same color and then clear a row or column of treats on the same spot. If there is more than one popper inside the popper, say two, then two splashes will hit the nearest same-color treats and clear two rows and columns of treats. 4. Swap a Popper with a Bomb treat (sweet with three candles on it) and its splash will hit a nearby treat of the same color. Once it pops the same-color treat, a small explosion will remove surrounding sweets. 5. Swapping a popper with a rainbow star will turn all sweets of that color into poppers. 6. Swapping a popper with another popper will remove random sweets of the same color. So if you swap a green popper with a red popper than their splashes will remove a random green and red sweet. Match 4 sweets of the same color to create a special arrow treat. Now match the special treat with 2 more same colored treats to trigger a row/column blast. If the arrow’s direction is horizontal, then it will remove a row of treats and if vertical, a column of treats will be removed from the game board. Match 5 treats in an L-shape to create a bomb treat. This special treat will have three birthday candles on it. Now match it with 2 more sweets of the same color and an explosion will remove all surrounding sweets. Match 5 treats in a straight line to create a rainbow star. Match it with any sweet and it will remove all sweets of that color from the game board. Swap an arrow treat with a bomb treat to remove three rows and columns at the same time. Swap a bomb treat with another Bomb treat to create a bigger explosion. Swapping a rainbow star with an arrow treat will add arrows to all sweets of that color. Those sweets will then clear a row or column depending on the direction of the arrow. So if you swapped a rainbow star with a red treat having a horizontal arrow symbol on it, then all sweets of that color will also have horizontal arrows. All of them will clear rows. In levels where you will have to clear a path to the door, make sure there are no obstacles or rock candies near your customer. If there are some barriers, then try to remove those first by matching treats near them. Examine the game board and look for big matches first. 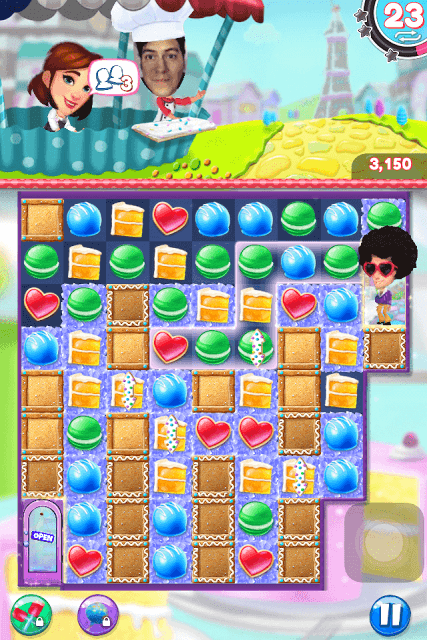 Match sweets in the middle of the game board to clear any rock candies or obstacles. 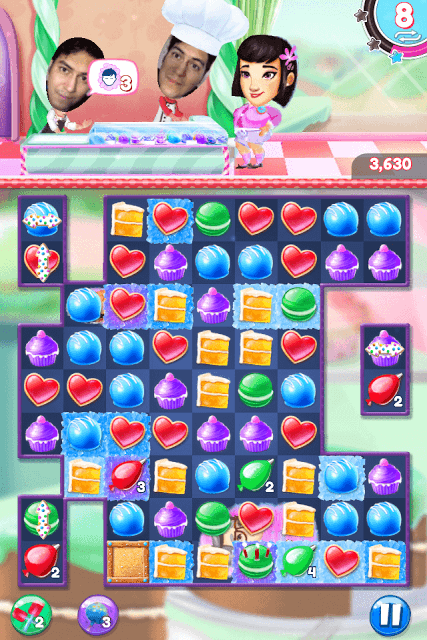 When the obstacles in the front of the customer are cleared, you can see an incomplete path appearing on the game board, just follow the incomplete path and keep matching sweets close to it to quickly connect it to the door. Do remember that you will have to clear paths for multiple customers, so try to create a path using few moves. While matching sweets, scan the board and look for the shortest path that connects to the door. Make the most of special treats. In such levels, the Frosting popper and Arrow treats can be of great help. Try creating some of those special treats and make way for your customers! If you can’t find any 4 or 5-treat matches, it’s because the game board does not contain the sweets of your choice. Try matching sweets in the middle and at the bottom of the game board. This will make way for new sweets from the top section of the game board. New treats will come down as you keep on matching treats in the middle and the bottom of the game board. Connecting to Facebook not only provides rewards but also lets you hire a buddy to help you beat a level. You will just have to send a level lifeline request to you friend and he/she will do it for you. You too can help your friends beat their levels. Connect and wait for their request. Finding hidden friends in Crazy Cake Swap is fun, provided you create plenty of special treats and use them to remove rock candies. Keep looking for 4 or more matches; create more arrow treats and Frosting Poppers to discover friends hidden beneath rock candies. I’m also stuck on level 1251. Can somebody please help me? I’m on level 1251. I cannot get out of it. I need help. What do the colors of the munchers mean? In level 744, I am having a hard time. What is the trick? Baskets are located on the bottom of the game board. In level 84, you will notice that the eggs are on the top of the board. You will have to bring them down until they drop into baskets, which look like plates. Keep matching treats to try to bring them down as fast as possible. You can match treats that located on the bottom of the eggs if you want eggs to move down quickly. For best results, create special treats so that more treats are cleared and eggs move down quickly. As the eggs move down, you will notice that the game board scrolls downwards. When it stops scrolling, it means you have reached the bottom of the board. Now you just have to bring the eggs further down until they drop into the baskets placed on the end of the board. What are the baskets for the eggs , level 83.